Goodness, Katie, I am surprised by your comment. I thought that the days of gym knickers were consigned to history! Where was your school? It's nice to see nothing much has changed since 1958! In my last year of school which was 2017 we were still playing netball on the outside courts wearing a PE kit if gym knickers and tee shirts. Stewart, seems you and I went to similar schools we were strictly in bare feet for all PE lessons in or out rain or shine. I even remember cross country in the snow barefoot. Just following on from a few of these comments. I attended an English Grammar School in the late 1960s and early 70s, and there was a strict no footwear rule for most PE, both indoors and out, including cross country. I can name at least three of the girls in the picture but not sure if it would be acceptable to do that. I was in the same form as these girls. I seem to remember it was 2B. We did indeed go on cross country runs in winter wearing just shorts and plimsoles (No £200 trainers in those days.) In the gym it was shorts and bare feet. Punishments were delivered with a cane or a plimsole across the backside. However, we were mostly happy kids and there was great camaraderie. There are a few photographs on the internet of the school in the late 50s, not long after it had opened. Mr Dent was the Headmaster and swanned around in a black gown which always seemed to be in tatters through getting snagged on door handles. Happy Days. We just got used to being compelled to participate in sports with nothing on our feet and honestly after the initial shock of mud between your toes you got used to it. Plus much easier to clean afterwards and running barefoot meant we weren’t carrying heavy waterlogged plimsolls on our feet. We always wore footwear (plimsolls or hockey boots) for outside PE or games, but often went barefoot in the gym. Andrea, this was in the late 70s and we played in bare feet all year round. We even ran the cross country barefoot. What decade was that and was it both summer and winter that you had to go barefoot? Nice picture and brings back fond memories of me and my friends playing netball amongst other sports outdoors in navy blue gym knickers and a small white tee shirt. We weren’t allowed though to wear footwear and certainly not white plimsolls as we were compelled to play in our bare feet. Gym knickers like that were standard when I was at secondary school in the early 1960s. Ours were blue, but I can remember other schools having green and brown. We were never allowed tracksuit bottoms. Ted, I'm surprised that although there have been over 17,000 views on this site only 6 comments have been made. I was at a boys secondary school from 1955 to 1961. 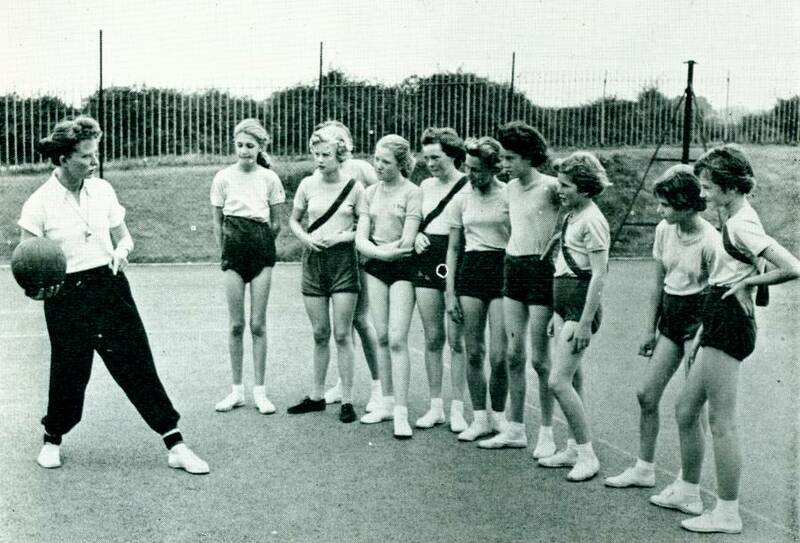 I wore short trousers until early 1958 and for PE, in common with the majority of schools at that time and for decades after, we were only allowed to wear just PE shorts and plimsolls in the gym and outside including cross country running.All the girls in the photo certainly look to be showing a good bit of leg even if the PE mistress is wearing tracksuit bottoms. This was female pupils from classes 3a and 3b, a posed photo for a Lancashire Life article on a fabulous school. I was there from 1954 to 1960. It is disgusting that boys are not allowed to cover their legs for sport but girls are. School uniform is compulsory, and we ask for the full co-operation of every parent in ... Items of uniform for boys and girls: ... (Boys do not wear tracksuit bottoms). I am glad PE ended for me in May 1989. I remember this picture appearing in a feature on the school in Lancashire Life. Some of the girls were my classmates. The one nearest the camera eventually became Head Girl in 1963/4. Although my own secondary school days started almost a decade and a half later, in the early 1970's, the photo doesn't look too dissimilar to how I remember our first year PE lessons. Possibly my gym knickers weren't quite as large as some of those on the photo, but otherwise one of the tall girls with thin legs and a flat chest could be me! Picking up on a few of Gillian's comments, our PE teacher didn't stand any messing about in her lessons and enforced the uniform rules strictly (the girl with the black plimsolls would have been in trouble at our school - they had to be white and kept clean). I also remember her having a word with a few of my classmates about asking their mums to buy them bras when she thought they needed one (I avoided that particular indignity as my mum had already had that conversation with me prior to the start of my second year - following a growth spurt over the summer holidays). Showers were compulsory, although we all tried to get away with a quick splash particularly in winter when the changing rooms were cold! On the whole I rather enjoyed PE and was always quite active out of school too. Just came across this by accident. I was 14 in 1958, not at this school though. The amazing thing is that I could have been. We looked just like this. We did a lot of PE and then there were games on Wednesday afternoons, and, if you were in a school team, Saturdays as well. Just a thought, but I cannot remember a single overweight girl. We all looked quite fit and slim. How times have changed. Of course I realise that I might be a little selective but I cannot honestly remember weight being an issue for anyone I knew then. Now, of course it is different, sadly. I think that our PE teacher was pretty hard on us all. She had very high standards. Before we left the changing rooms we had to stand still with our kit bags and be properly dismissed. Any messing about was dealt with harshly, a detention or horrible cross country run after school. Would that happen now? Everything was quite regimented when you were younger but as girls developed she was very understanding and had some good advice about the 1950's version of sports bras! We were never forced to shower but she would always explain why it was such a good idea, in particular when you got through puberty. Looking back she obviously cared about what she did. I do have fond memories of those times. We were lucky to have people of that calibre teaching us about sport and life.